The school of spirituality, as indicates the name itself, signifies a style of Christian life and system of his forming in which all the elements of spirituality such as: the image of God, prayer, asceticism, ascetical practises, interpersonal relationships… are strictly related to each other. Each school of spirituality has its own founder, doctrine and disciples, who live according to its rules. Schools basicly differ among each other in three elements: model of sanctity, suggested means to its achievement and tips regarding the interior life. To the great schools of Christian spirituality belong, among others, the Benedictines, Franciscans, Dominicans, Carmelites or Jesuits. The school of St. Faustina, which grows from her charism and mystical experience, joined the group in our times. The school of St. Faustina’s spirituality is rooted in the mystery of Divine Mercy which lies in its foundation and in the centre itself, and is the binder of all the elements of the interior life. It forms the image of God, sacramental life, asceticism, namely, everything which compounds the reality in the relation between man and God. Hence the school of St. Faustina’s spirituality is marked out and characterised by the coming to know the mystery of Divine Mercy and contemplating it in everyday life and the ensuing attitude of entrustment to God and merciful love toward neighbour. The image of this school is completed by the following features: having love for the Church, Eucharist and devotion to Our Lady. These elements, which also appear in other schools of spiritualities, in the school of St. Faustina have a typical “aspect” of mercy. 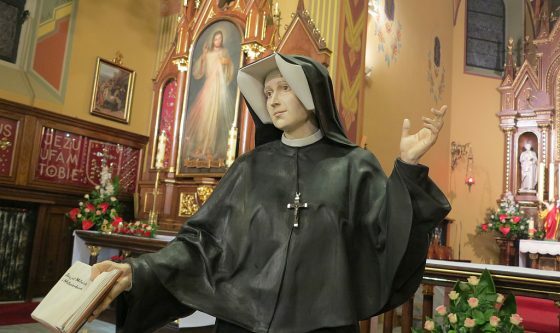 The foundress of this school – Saint Faustina – was directly formed by Jesus Himself. He was her Master, He taught her through different mystical experiences and words, formed her spirituality to show through it a model of Christian perfection completely founded on the mystery of the Divine Mercy. The school of St. Faustina is profoundly evangelical because it revokes to the foundation of Christianity (the attitude of trust in God and mercy towards neighbours) and at the same time is universal because it is reserved and accessible for every man without consideration of the type of vocation, social conditions or others. The contemporary apostles of Divine Mercy, who carry the gift of the message about merciful love of God for every human being, form their spiritual life in the school.